The Lotus 102B wasn’t very good. But not all F1 cars can be. The only reason why this car was produced as a model kit was due to one of it’s sponsors being the Japanese hobby manufacturer, Tamiya. That and the starting place for a certain Mika Hakkinens introduction to F1. But it was also the last taste of F1 for the unlucky British driver Julian Bailey, who landed a seat with the Team Lotus following an unsuccessful debut season with Tyrrell in 1988. 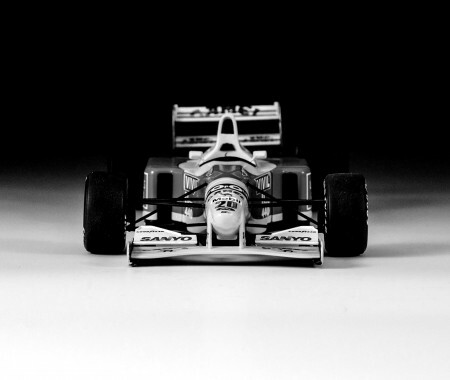 His second F1 race seat – The 102B designed by Frank Dernie and powered by the Judd V8, was littered with new components for the 1991 season, as the team sought to develop the previous years car and mount some sort of challenge to the rest of the field. Unfortunately, due to the lack of performance in the car and inherent reliability issues, Bailey only managed to qualify for just one of his first 4 races of 1991, earning a handsome 6th place at the San Marino GP. Failure to qualify for the following Monaco GP meant that Baileys seat was replaced and he unfortunately didn’t make the grade in F1 again – no thanks to the 102B. Despite it’s short falls as a racer, the 102B model kit was really good fun to build. It was also my first experience with a photo-etch set, so I took my time on this one to get as good a finish as my skills would allow. The basic Tamiya kit was complimented by a Studio27 detail set I grabbed online, some Scale Motorsport plain weave carbon fibre and an extra set of livery decals ( I had a feeling that this one might need some spares), I was very patient with several areas of this model and I think it paid off. Working with the photo-etch certainly required a different technique, but the effect that it has given the model is much more life like – thicknesses of the wing end plates, seatbelts and gurney flaps all add that little bit extra to the build, making it one of my best efforts yet ( even if I do say so myself). The experience has also made me want to include as much photo etch in my future builds as possible. There were a few problem areas with this model; getting the large green decals to line up proved tricky, and required a lot of patience and a lot of Microsol to make them to conform to the contours of the car, especially on the engine cover. Cutting those larger decals up into smaller parts helped with the alignment, but especially towards the back of the car, alignment isn’t quite spot on. Since finishing the build, I have heard of other modellers painting the green areas, and only adding the yellow pin stripes as decals… I think that may be even more of a hard task. In the engine, I again added a bit more detail, building some scratch shock absorbers, engine mounts and adding some plumbing to the radiators. I think model kits look daft without the coolant pipes, so I always attempt to add something in there, otherwise you are left with an odd looking empty space. A few photo etch washers have added a bit more detail to certain areas too. Around the piping, I applied some pre-shrunk heat shrink tube, glued in place, with a little strip of Bare Metal Foil for the impression of a hose clip. Finally, this model was also the first time I used A Micromesh Polishing kit – but only very carefully on the larger surfaces of the bodywork and very, very gently. This is one I am proud of – and a fitting tribute to Baileys moment in the spotlight.